Java Latte cigars are another great offspring created by Jonathan Drew of Drew Estate and Rocky Patel. These hand-rolled premium cigars are considered the best coffee-infused smokes available on the market today. 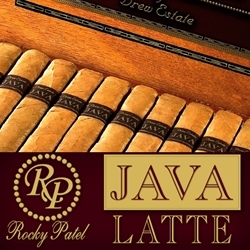 Rocky Patel Java Latte cigars are box-pressed consisting of savory and robust Nicaraguan tobacco blends wrapped up inside a light, caramel-brown Ecuador Connecticut wrapper. These premium cigars burn perfectly with a nice, creamy and well-balanced easy draw. A nice cup of coffee accompanied with a Rocky Patel Java Latte make an excellent partnership. Smokers Discounts believes you'll really enjoy Rocky Patel Java Latte premium cigars and we can have them delivered right to your front doorstep. We’ve made it easy and affordable to buy these hand-rolled cigars online. A variety of sizes and flavors are listed below in our online cigar store. Each of these styles are in stock and available today for a low discount price. Call us for more details!